We're there any more of these there? Was it marked at the proper price on the shelf, then it scanned at £37?? Checked Beaumont leys, Hamilton and narborough rd. no physical stock on shelves. Customer service not around after 10pm. have you used it yet? 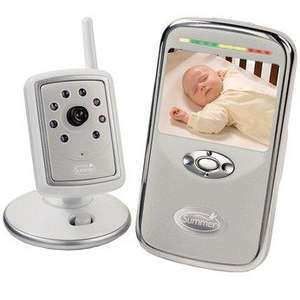 if so can you comment on the picture quality as my current baby monitor is on its last legs and my little girl keeps getting her arm stuck in the cot railings! would be easier if I could just see why she's crying. thanks for posting hot from me. Nice find! I've got one of these already, wouldn't mind another. It's a better alternative to sound-only monitors; seeing your child is more reassuring. Wish it had a zoom/tilt/pan function. Can't go wrong for this price; paid at least £80 originally. Nice find! I've got one of these already, wouldn't mind another.It's a … Nice find! I've got one of these already, wouldn't mind another.It's a better alternative to sound-only monitors; seeing your child is more reassuring. Wish it had a zoom/tilt/pan function. Can't go wrong for this price; paid at least £80 originally. Subject to audio expectations, possibly consider a Dlink DCS-930L wifi IP camera with sound, assuming you already have a wireless router and a smartphone / tablet / laptop / PC available. Would also be able to monitor image and sound away from home via 3g / access to other wifi. And / or it can double as an internal security cam. or with nightvision DCS-932L at around £65+.